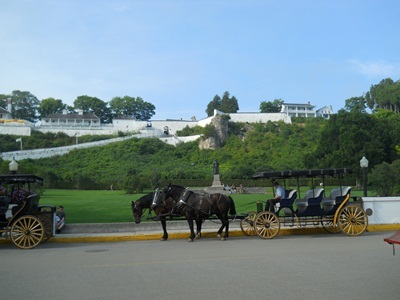 With a spectacular backdrop, the Mackinac Island's Music in the Park summer concert series takes place on the lawn of a National Historic Landmark, Marquette Park, at the foothills of Historic Fort Mackinac downtown across from the marina. Bring a picnic and tune in for some great live folk, rock, country, blues--the best of Americana in a perfect Northern Michigan setting. All concerts are free, 8pm, Marquette Park, Thursdays in July. July 3 American Opera American Opera is a musical project consisting of John Bee and his friends. Hailing from Saginaw, Michigan and recently transplanted to New York City, by way of a short stint in Chicago, American Opera draws comparisons to The Avett Brothers, Iron and Wine, and David Bazan. John’s trademark voice couples with his introspective and deeply personal lyrics, making a connection to anyone within earshot. July 10 The Accidentals They met in 2011 at their public high school. Katie, a freshman cello player, "playing up" in the Philharmonic Orchestra, and Savannah, a junior, Concert Master violinist, volunteered for a class assignment that threw them together for their first rehearsal- and The Accidentals were born. It's not surprising that both girls grew up in musical families with influences from rock to classical, jazz to bluegrass. Their collective loves you won’t find readily on mainstream radio. July 17 Jetty Rae Jetty Rae is a singer and songwriter originally from Northern Michigan. She has been singing, touring, and recording since 2004. She released her first full-length album, “Blackberries,” in 2007; her first EP, “Nobody,” in November 2009; and a lullaby album, “La La Lu and the Lazy Moon,” in July 2011. Her album “Drowning in Grain” was released in February 2012, and “Climbing Clouds” was released in August of 2013. Jetty garnered the attention of JetBlue when she played at the opening of their new Terminal at JFK International Airport. MTV.com interviewed Jetty for their “Needle In The Haystack” series, and her song “I Love You,” was selected as a free download and featured on their up-and-coming artist blog. July 31 Karisa Wilson and Ensemble Karisa Wilson is an award winning singer-songwriter from Michigan. She writes and performs a blend of Indie folk, jazz and blues. She's also a classically trained violinist. Her albums "Little Girl" and "Stronger" have been awarded "Best Album" & "Best Folk Album" by the WYCE Jammies, one of Michigan's most prestious Indie awards. Whether playing guitar, violin or upright bass, Wilson expertly weaves her powerful jazz-laden voice with modern folk and, at times, even country tones.